North County Property Group is a leader in San Diego Property Management services we offer to the City of San Diego and our rates for the value we offer can’t be beat. Our team of San Diego property management experts will be happy to assist with all of your needs whether you are seeking long-term or vacation renters. 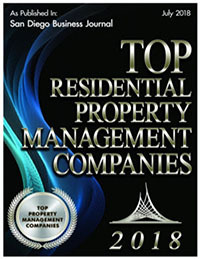 San Diego Property Management Business Certificate #B2013035512. For the fourth year in a row, North County Property Group has been awarded by the San Diego Business Journal as a Top San Diego Property Management Company. (San Diego Business Journal, Vol. 39, No. 28, July 2018, page16). . The top 20 list ranks San Diego Property Management Companies annually based on number of units managed, growth rate, and total value of properties under management. North County Property Group ranks as the fastest growing San Diego property management company in San Diego North County, posting an impressive 30% year-over-year growth rate. North County Property Group also ranks #1 in average home value managed with a San Diego County highest $1.25 million per home, more than two times the average home value of the next ranked competitor. What does this mean? It shows our dedication to focusing on the high-end of the San Diego rental property market and that we have earned the trust and confidence of a large number home owners with exquisite homes who have desired San Diego Property Management. There are many reasons to hire a San Diego property manager. If you're searching for efficient and attentive property management professionals to manage your beautiful home, look no further than North County Property Group. North County Property Group provides an exclusive and value added service to our property owners called Listing Tracker! Listing Tracker is a comprehensive report for our clients with rental listings that are currently active, vacant and listed with North County Property Group. 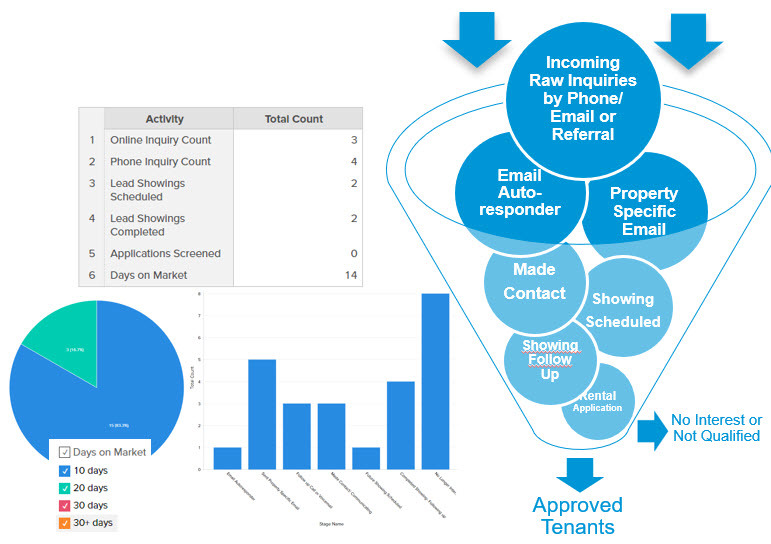 A link to your dashboard is sent weekly by email, typically every Friday, to provide you with insights into how your property is performing on several key metrics as a measure of overall interest level in the market: lead volume, the number of inquiries we have been able to reach, how many showings have been scheduled, rental applications received, etc. Listing Tracker Dashboard includes graphical reports, feedback from prospective tenants who have visited the property, and recommendations from North County Property Group to get your property rented. As a San Diego property management client of North County Property Group, this is a great resource for you to remain up to date on the ongoing activity levels. Best of all, it is included for free as part of our high value philosophy. Check Out a Few of our San Diego Rental Property Tours Below! As a full service San Diego property management company, our team is responsible for taking care of all aspects of managing your rental(s). Why Get a Rental Price Analysis & Rent Grade? San Diego is one of the most highly sought after living and vacation destinations in the world and North County Property Group manages many rental homes within the city boundaries. There are many unique communities of San Diego where we have rental homes under management, including Carmel Valley, Santa Luz, La Jolla, Rancho Penasquitos, Scripps Ranch, and Rancho Bernardo. Known for its mild year-round climate, miles and miles of beaches, and historically low crime rates, San Diego and San Diego County offer a laid-back approach to life. Popular attractions include the San Diego Convention Center, Balboa Park, the San Diego Zoo, whale watching cruises, and the ever-growing craft beer industry. North County Property Group has rental properties in our property management portfolio that cover many areas in San Diego County. We provide our property management services to diverse neighborhoods and populations with various needs such as students attending our universities such as San Diego State University (SDSU), University of California, San Diego (UCSD), University of San Diego (USD), and the San Diego Community College District; military families stationed at our US Navy facilities, Marine Corps bases, and Coast Guard stations; technology executives in Sorrento Valley, San Diego, and Rancho Bernardo tech centers; medical and healthcare professionals from Scripps Clinic, Kaiser Permanente, and Sharp HealthCare; or the many other San Diego County residents living throughout the area. North County Property Group is the fastest growing and top ranked San Diego property management company, having offices which serve the San Diego area in North County, Central San Diego, and Downtown San Diego. We started the company in San Diego in 2001, so we’ve been in business for over 18 years providing San Diego County with our top-notch property management services. We are completely transparent with our property management San Diego fee structure so let's start there! There are NO up-front fees or start-up costs until your home is rented. Please view our pricing page to learn the details! We have many homes under management throughout San Diego County so your home would be in good hands! We would love to work with you as your San Diego Property Manager.